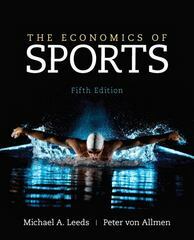 The Economics of Sports 5 Edition Directed primarily toward undergraduate students in the Sports Economics course, this text also provides practical content to current and aspiring industry professionals. Core economic concepts developed through examples from the sports industry. The sports industry provides a seemingly endless set of examples from every area of microeconomics, giving readers the opportunity to study economics in a context that holds their interest. The Economics of Sports explores economic concepts and theory—industrial organization, public finance, and labor economics—in the context of applications and examples from American and international sports.